Fig. 2 illustrates a small oscillator designed for certain specific uses. The underlying idea was to attain great activities during minute intervals of time each succeeded by a comparatively long period of inaction. With this object a large self-induction and a quick-acting break were employed owing to which arrangement the condenser was charged to a very high potential. Sudden secondary currents and sparks of great volume were thus obtained, eminently suitable for welding thin wires, flashing lamp filaments, igniting explosive mixtures and kindred applications. 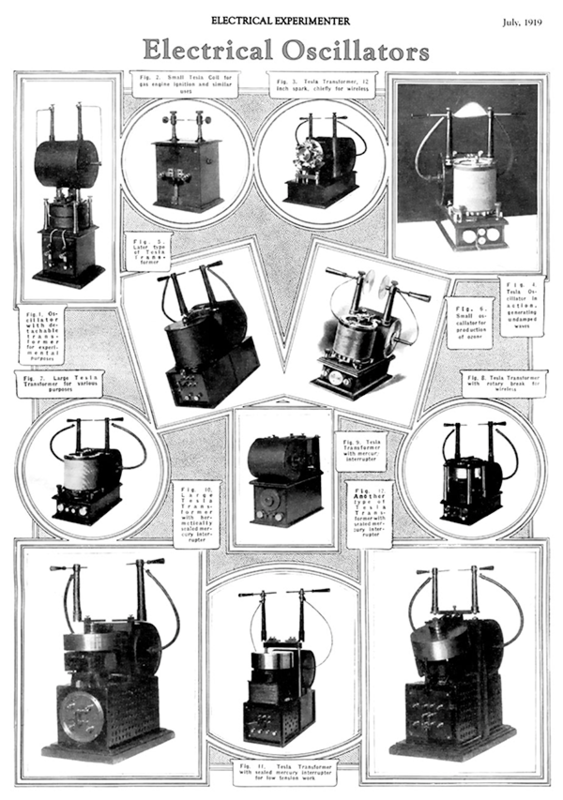 The instrument was also adapted for battery use and in this form was a very effective igniter for gas engines on which a patent bearing number 609,250 (Electrical Ignitor for Gas Engines) was granted to me August 16,1898. Coming now to machines of the second class, Fig. 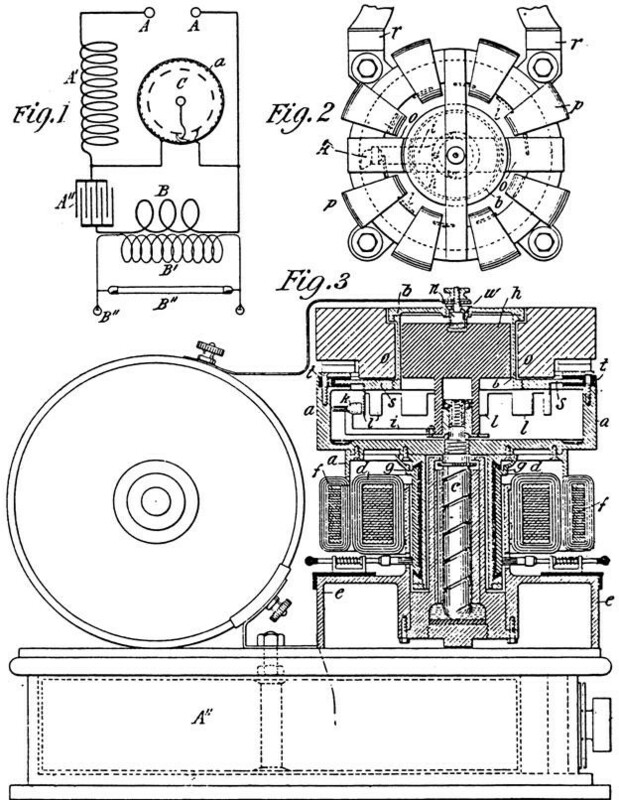 9 shows an oscillatory transformer comprising a condenser and charging inductance enclosed in a box, a transformer and a mercury circuit controller, the latter being of a construction described for the first time in my patent No. 609,251 (Electric Circuit Controller) of August 16, 1898. It consists of a motor driven hollow pulley containing a small quantity of mercury which is thrown outwardly against the walls of the vessel by centrifugal force and entrains a contact wheel which periodically closes and opens the condenser circuit. By means of adjusting screws above the pulley, the depth of immersion of the vanes and consequently, also, the duration of each contact can be varied at desire and thus the intensity of the effects and their character controlled. This form of break has given thorough satisfaction, working continuously with currents of from 20 to 25 amperes. The number of interruptions is usually from 500 to 1,000 per second but higher frequencies are practicable. The space occupied is about 10" X 8" X 10" and the output approximately 1/2 kW. In the transformer just described the break is exposed to the atmosphere and a slow oxidation of the mercury takes place. This disadvantage is overcome in the instrument shown in Fig. 10, which consists of a perforated metal box containing the condenser and charging inductance and carrying on the top a motor driving the break, and a transformer. The mercury break is of a kind to be described and operates on the principle of a jet which establishes, intermittently, contact with a rotating wheel in the interior of the pulley. The stationary parts are supported in the vessel on a bar passing through the long hollow shaft of the motor and a mercury seal is employed to effect hermetic closure of the chamber enclosing the circuit controller. The current is led into the interior of the pulley through two sliding rings on the top which are in series with the condenser and primary. The exclusion of the oxygen is a decided improvement, the deterioration of the metal and attendant trouble being eliminated and perfect working. Fig. 11 is a photograph of a similar oscillator with hermetically inclosed mercury break. In this machine the stationary parts of the interrupter in the interior of the pulley were supported on a tube through which was led an insulated wire connecting to one terminal of the break while the other was in contact with the vessel. The sliding rings were, in this manner, avoided and the construction simplified. 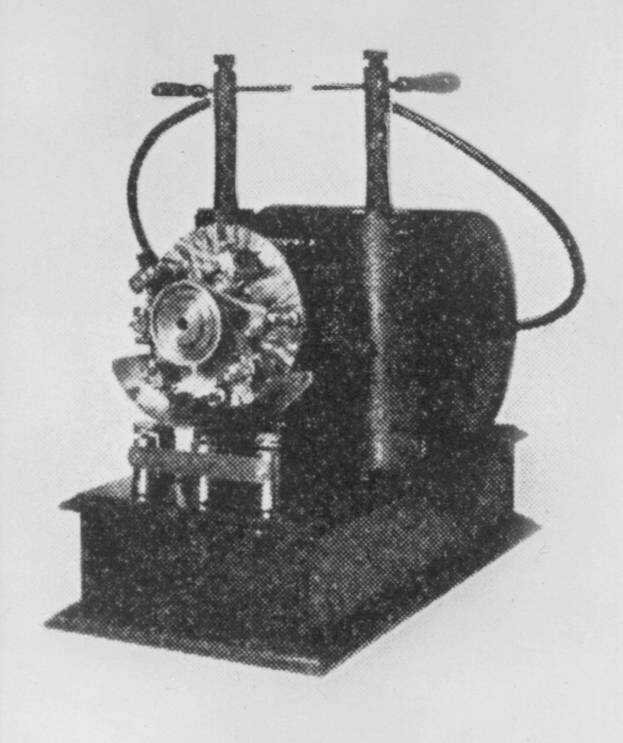 The instrument was designed for oscillations of lower tension and frequency requiring primary currents of comparatively smaller amperage and was used to excite other resonant circuits. Fig. 12 shows an improved form of oscillator of the kind described in Fig. 10, in which the supporting bar through the hollow motor shaft was done away with, the device pumping the mercury being kept in position by gravity, as will be more fully explained with reference to another figure. Both the capacity of the condenser and primary turns were made variable with the view of producing oscillations of several frequencies. Fig. 13 is a photographic view of another form of oscillatory transformer with hermetically sealed mercury interrupter, and Fig. 14 diagrams showing the circuit connections and arrangement of parts reproduced from my patent, No. 609,245 (Electrical Circuit Controller), of August 16, 1898, describing this particular device. The condenser, inductance, transformer and circuit controller are disposed as before, but the latter is of different construction, which will be clear from an inspection of Fig. 14: The hollow pulley a is secured to a shaft c which is mounted in a vertical bearing passing through the stationary field magnet d of the motor. In the interior of the vessel is supported, on frictionless bearings, a body h of magnetic material which is surrounded by a dome b in the center of a laminated iron ring, with pole pieces oo wound with energizing coils p. The ring is supported on four columns and, when magnetized, keeps the body h in position while the pulley is rotated. The latter is of steel, but the dome is preferably made of German silver burnt black by acid or nickeled. The body h carries a short tube k bent, as indicated, to catch the fluid as it is whirled around, and project it against the teeth of a wheel fastened to the pulley. The wheel is insulated and contact from it to the external circuit is established through a mercury cup. As the pulley is rapidly rotated a jet of the fluid is thrown against the wheel, thus peaking and breaking contact about 1,000 times per second. The instrument works silently and, owing to the absence of all deteriorating agents; keeps continually clean and in perfect condition. The number of interruptions per second may be much greater, however, so as to make the currents suitable for wireless telephony and like purposes.